A U-2 taxis through a ceremonial shower after completing 30,000 flight hours at an undisclosed location in Southwest Asia, Feb. 2, 2017. Firetrucks parked on either side of the U-2 and discharged water for the ceremony. 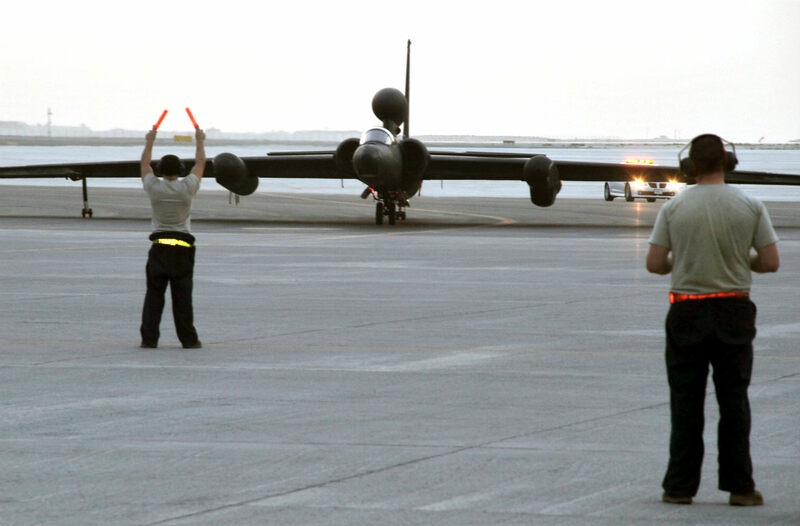 The milestone marks the second U-2 in the Air Force fleet to reach the historic milestone. A U-2 taxis through a ceremonial shower after completing 30,000 flight hours at an undisclosed location in Southwest Asia. These U-2 Dragon Lady Images were photographed by military veterans and service members. 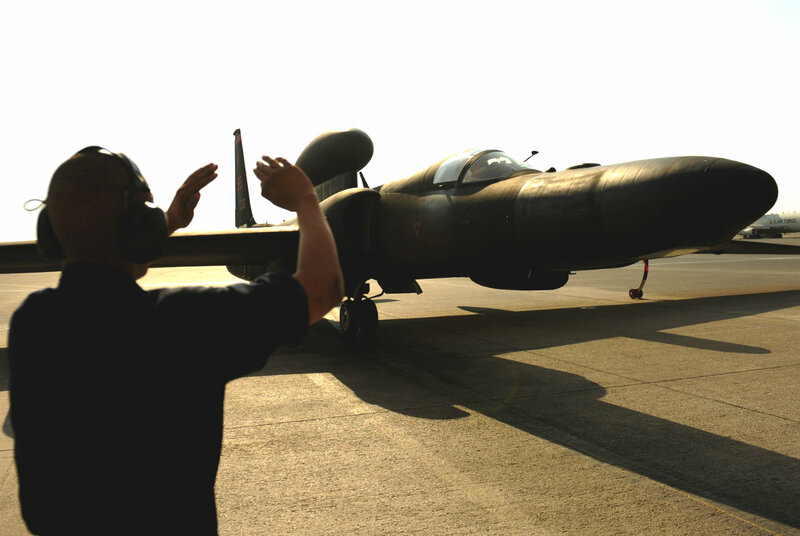 Maj. William Gottenberg, U-2 pilot with the 99th Expeditionary Reconnaissance Squadron, steers a U-2 Dragon Lady into park after completing his 100th combat mission in the U-2 from a non-disclosed base in Southwest Asia. A U- 2 Dragon Lady approaches an altitude near 70,000 ft. above California, Mar. 23, 2016. The pilot must wear a full-pressure suit similar to NASA astronaut suits. A U- 2 Dragon Lady approaches an altitude near 70,000 ft. above California. A U-2 Dragon lady pilot touches the nose of the aircraft before takeoff June 9, 2016, at Royal Air Force Fairford, Gloucestershire, England. A U-2 Dragon lady pilot touches the nose of the aircraft before takeoff, at Royal Air Force Fairford, Gloucestershire, England. A 380th Air Expeditionary Wing U-2 Dragon Lady launches from an undisclosed location in Southwest Asia, Feb. 10, 2017. 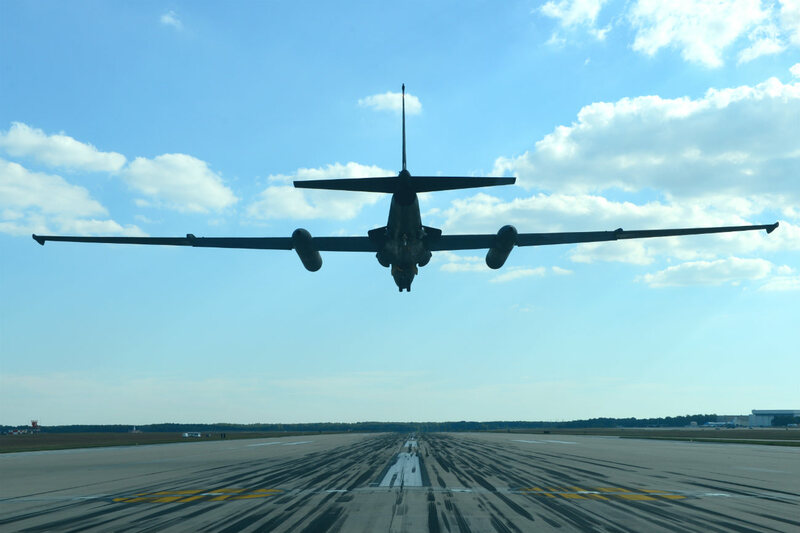 The historic U-2 has been in operation since the 1960s and continues its legacy in Combined Joint Task Force-Operation Inherent Resolve. A 380th Air Expeditionary Wing U-2 Dragon Lady launches from an undisclosed location in Southwest Asia. These U-2 Dragon Lady images were photographed by military veterans and service members. A U-2 Dragon Lady flies over the Golden Gate Bridge near San Francisco, California, Mar. 23, 2016. 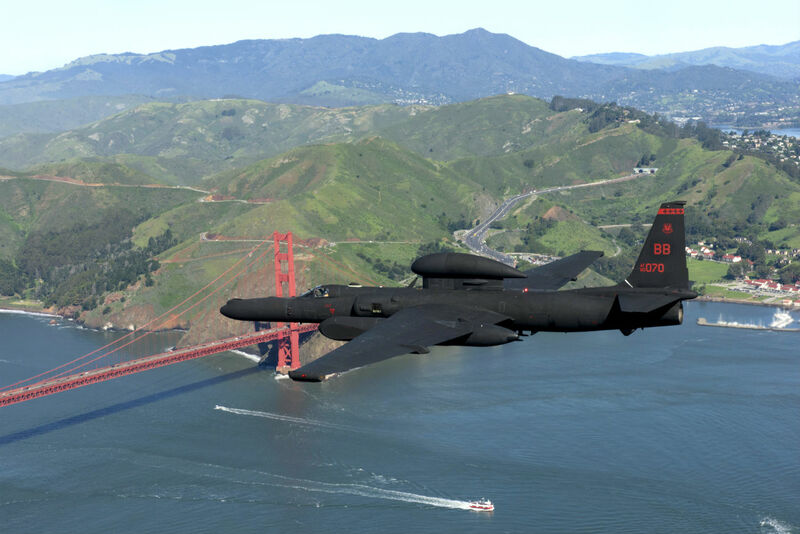 The U-2 is capable of flying at altitudes exceeding 70,000 ft.
A U-2 Dragon Lady flies over the Golden Gate Bridge near San Francisco, California. U.S. Air Force airmen push down on the wing of a U-2 Dragon Lady after its landing at RAF Fairford, United Kingdom, June 9, 2015. 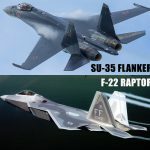 If the aircraft lands slightly off balance, it has the potential to tilt to one side or another. 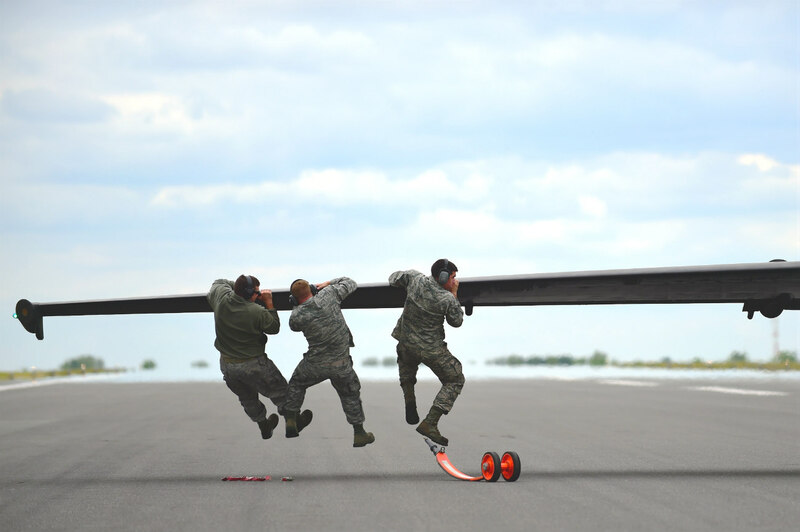 U.S. Air Force airmen push down on the wing of a U-2 Dragon Lady after its landing at RAF Fairford, United Kingdom. A U-2 Dragon Lady from Beale Air Force Base, Calif., departs the runway at Joint Base Elmendorf-Richardson, Alaska, May 3 during Exercise Northern Edge 2017. Northern Edge is Alaska’s largest and premier joint training exercise designed to practice operations, techniques and procedures as well as enhance interoperability among the services. 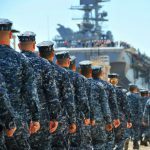 Thousands of participants from all the services, Airmen, Soldiers, Sailors, Marines and Coast Guard personnel from active duty, Reserve and National Guard units—are involved. A U-2 Dragon Lady from Beale Air Force Base, Calif., departs the runway at Joint Base Elmendorf-Richardson, Alaska, during Exercise Northern Edge 2017. U.S. Air Force Airman 1st Class Colin Cortez, a U-2 Dragon Lady crewchief assigned to the 380th Expeditionary Aircraft Maintenance Squadrom, signals the U-2 aircraft in during taxi to parking spot after flying mission while deployed to an undisclosed location in Southwest Asia on Nov. 23, 2010. U.S. Air Force Airman 1st Class Colin Cortez, a U-2 Dragon Lady crewchief assigned to the 380th Expeditionary Aircraft MaintenSquadronadrom, signals the U-2 aircraft in during taxi to a parking spot. These U-2 Dragon Lady images were photographed by military veterans and service members. 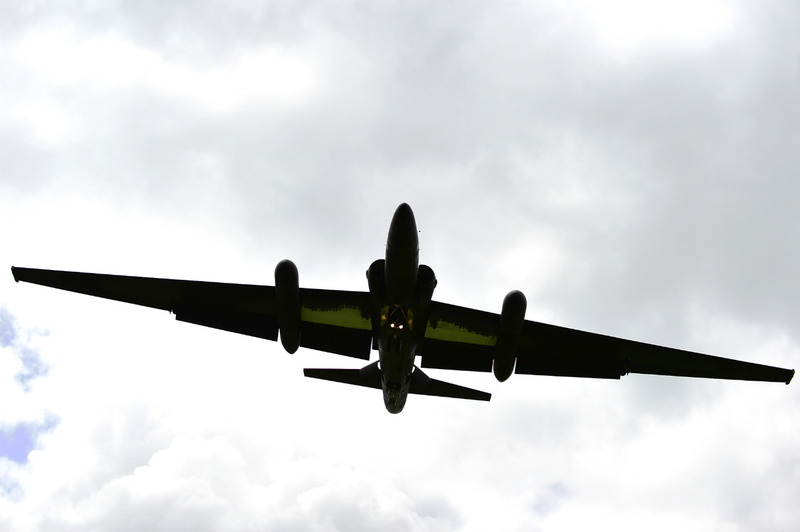 A U-2 Dragon Lady, from Beale Air Force Base, Calif., prepares to land at RAF Fairford, United Kingdom, June 9, 2015. 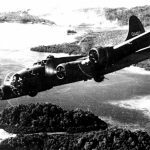 U-2 pilots have a small margin of space to effectively land the plane without causing damage to the aircraft. 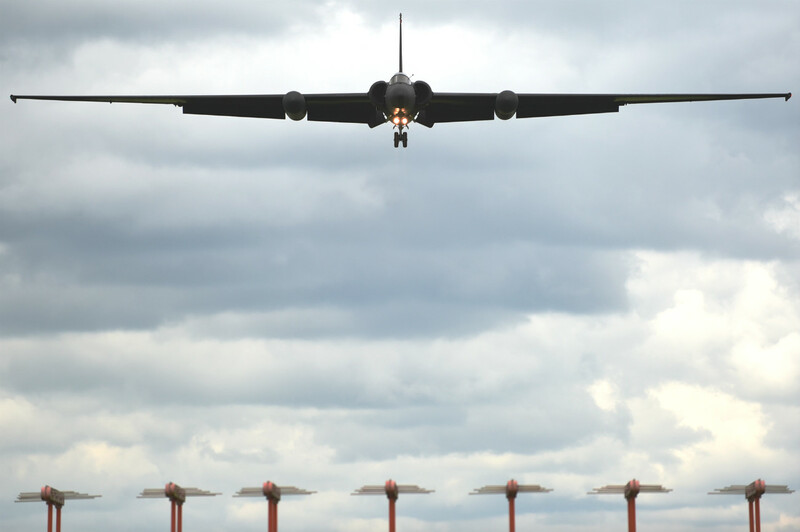 A U-2 Dragon Lady, from Beale Air Force Base, Calif., prepares to land at RAF Fairford, United Kingdom. A U-2 Dragon lady pilot touches the nose of the aircraft before takeoff during exercise Northern Edge 17 at Joint Base Elmendorf-Richardson, Alaska, May 10, 2017. 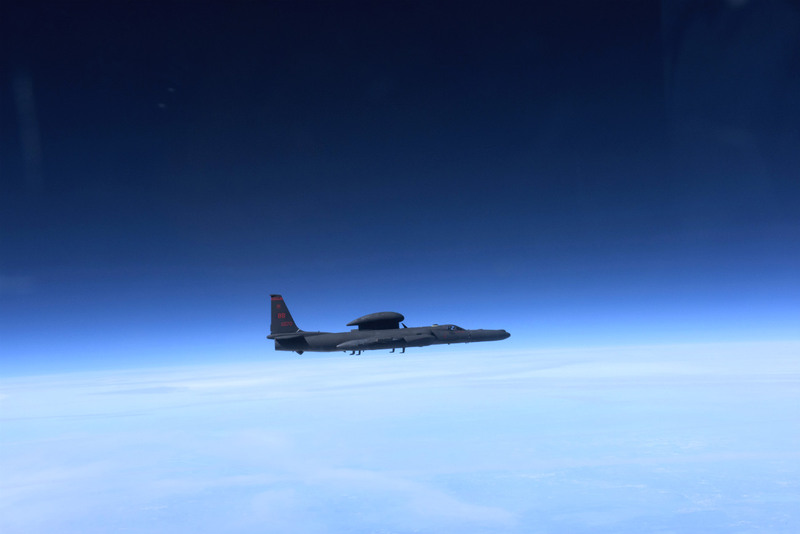 The U-2 participated for the first time in Northern Edge, which is a biennial joint training exercise involving approximately 6,000 personnel and 200 fixed-wing aircraft, and dates back to 1975. 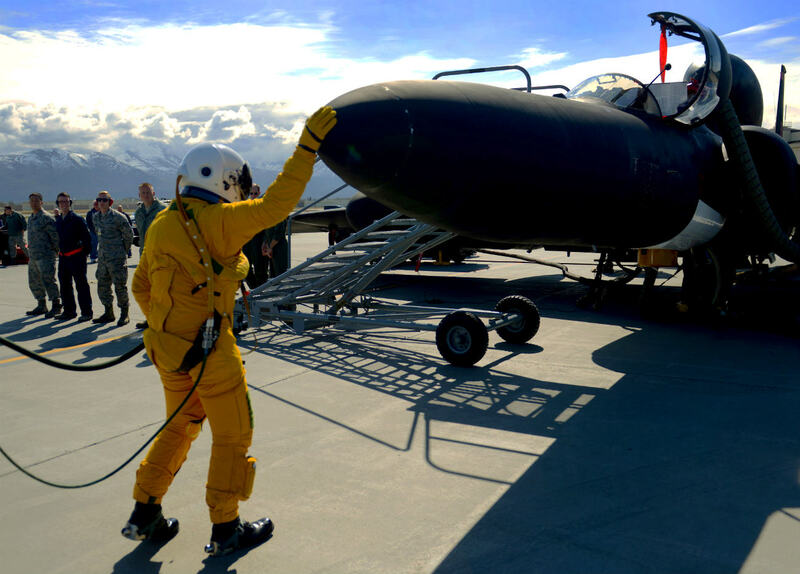 A U-2 Dragon lady pilot touches the nose of the aircraft before takeoff during exercise Northern Edge 17 at Joint Base Elmendorf-Richardson, Alaska. Capt. 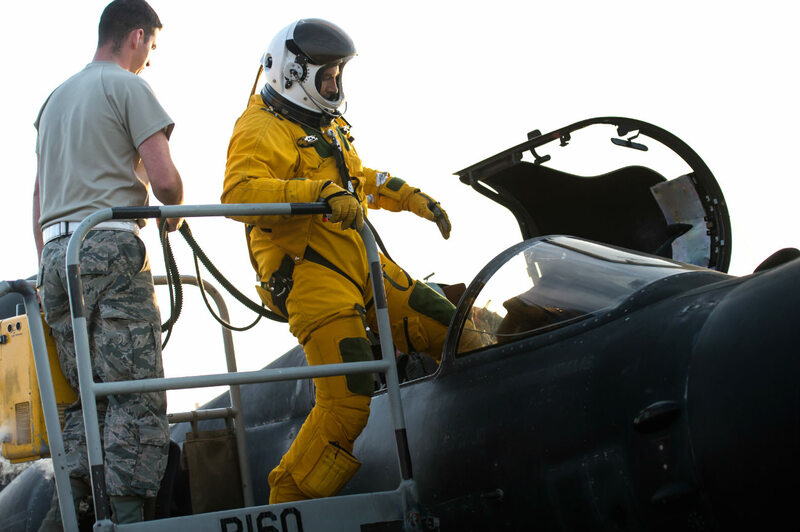 Peter J. Gryn signals that all systems are good from his U-2 Dragonlady, Oct. 4, prior to his first combat mission. He's deployed from Beale Air Force Base, Calif.
Capt. Peter J. Gryn signals that all systems are good from his U-2 Dragonlady. A U-2 Dragon Lady, from Beale Air Force Base, Calif., prepares to touch down at RAF Fairford, United Kingdom, June 9, 2015. During a landing, pilots stall the plane two feet off the ground to avoid damaging the aircraft upon impact. A U-2 Dragon Lady, from Beale Air Force Base, Calif., prepares to touch down at RAF Fairford, United Kingdom. These U-2 Dragon Lady images were photographed by military veterans and service members. 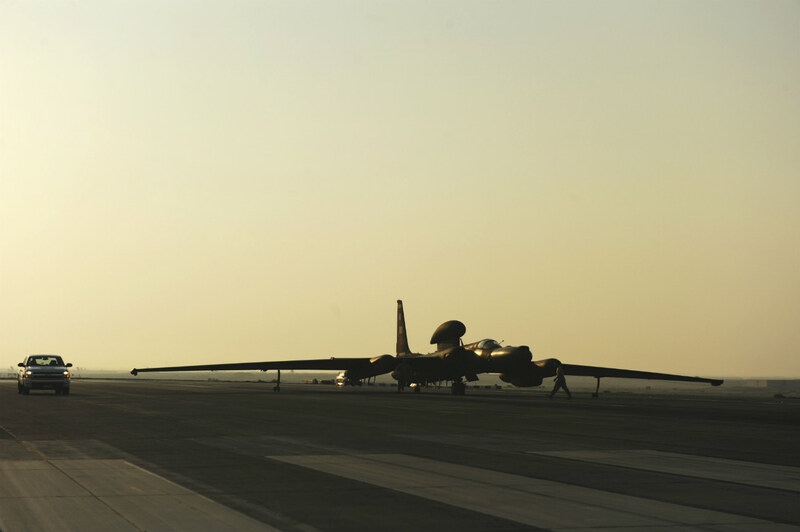 A U.S. Air Force U-2 Dragon Lady prepares to take off at an undisclosed location in Southwest Asia, Nov. 24. The U-2 is a high altitude reconnaissance aircraft that reaches altitudes above 70,000 feet. 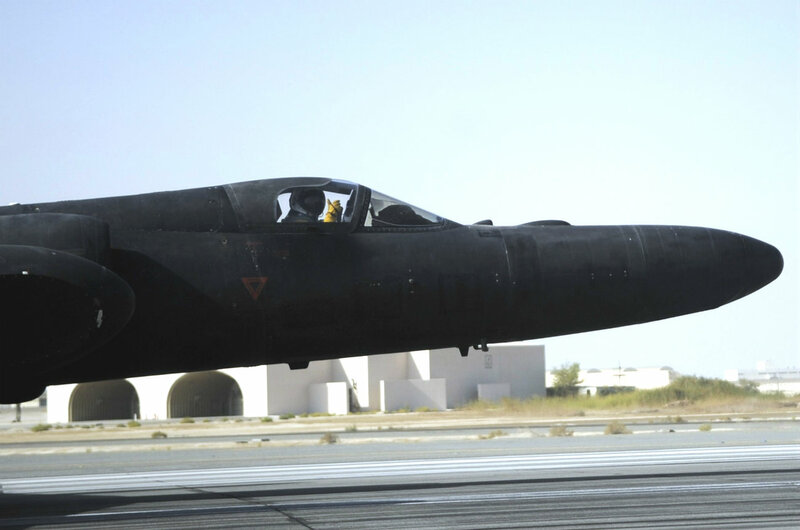 A U.S. Air Force U-2 Dragon Lady prepares to take off at an undisclosed location in Southwest Asia. Staff Sgt. Michael McLaughlin, 99th Expeditionary Reconnaissance Squadron physiological support technician, assists Lt. Col. Craig Nowicki 99th ERS U-2 Dragon Lady pilot, prepare for a memorial flight June 22 at a non-disclosed base in Southwest Asia. The memorial flight was the fifth held in honor of Maj. Duane Dively, a U-2 pilot that lost his life in a combat mission. Staff Sgt. 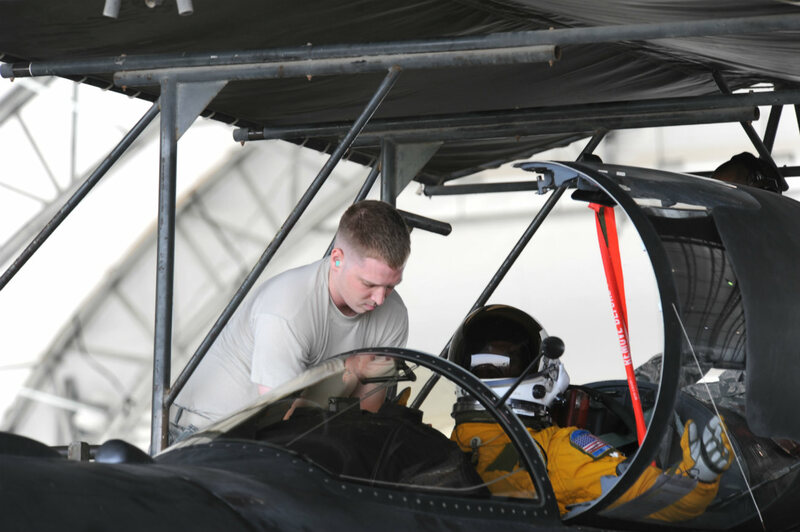 Michael McLaughlin, 99th Expeditionary Reconnaissance Squadron physiological support technician, assists Lt. Col. Craig Nowicki 99th ERS U-2 Dragon Lady pilot, prepare for a memorial flight. 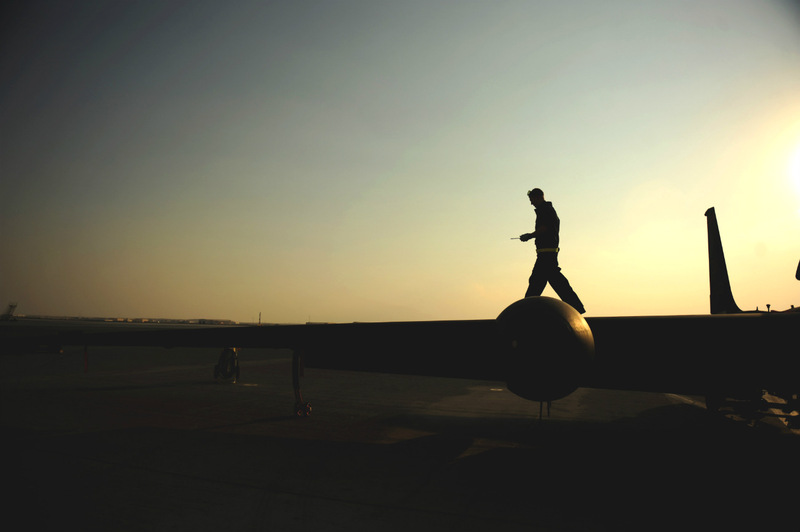 U.S. Air Force Senior Airman 1st Class Brian Burke, a U-2 Dragon Lady crewchief assigned to the 380th Expeditionary Aircraft Maintenance Squadron, walks down the wing after all checks are complete as the sun is setting on Nov. 23, 2010. 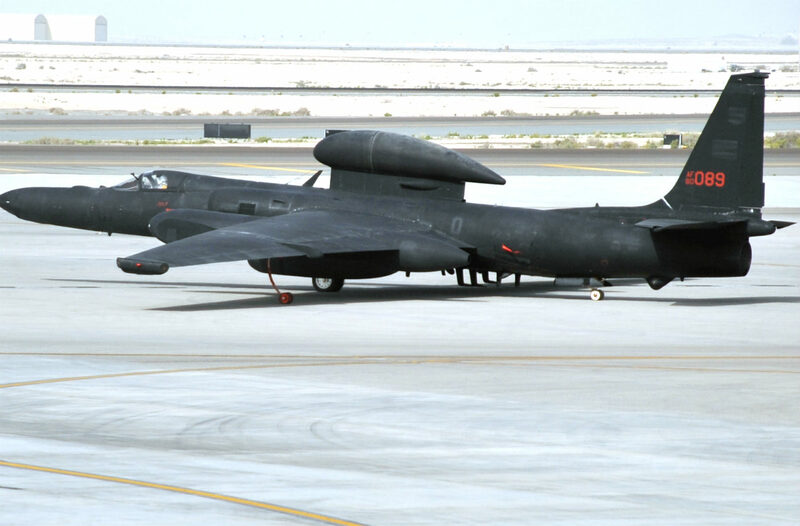 The U-2 Dragon Lady aircraft is currently deployed to an undisclosed location in Southwest Asia. 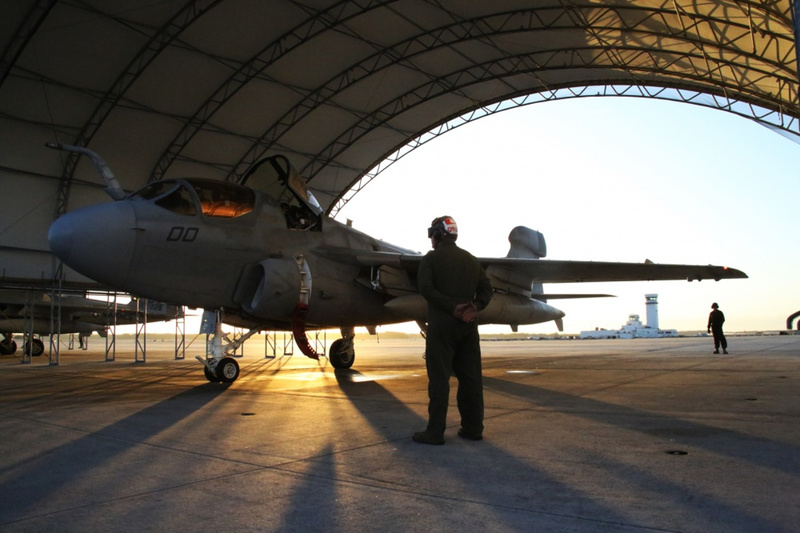 U.S. Air Force Senior Airman 1st Class Brian Burke, a U-2 Dragon Lady crewchief assigned to the 380th Expeditionary Aircraft Maintenance Squadron, walks down the wing after all checks are complete as the sun is setting. A pilot guides a U-2 Dragon Lady assigned to the 99th Expeditionary Reconnaissance Squadron of the 380th Air Expeditionary Wing to a parking spot on the airfield while being guided by a maintenance Airman from the 380th Expeditionary Aircraft Maintenance Squadron Dragon aircraft maintenance unit at a non-disclosed base in Southwest Asia April 9, 2010. 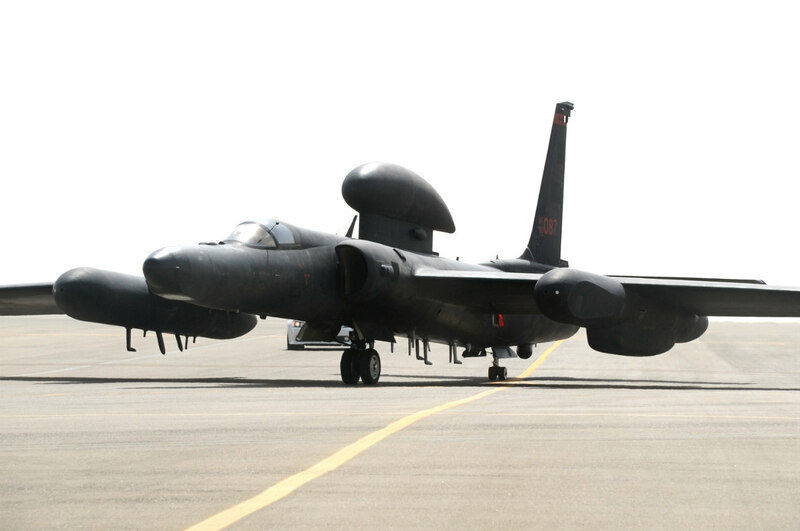 In the first three months of 2010, U-2s assigned to the 380th AEW and the 99th ERS flew nearly 200 combat sorties in support of operations in the U.S. Central Command area of responsibility. The U-2s, and the Airmen who fly and maintain them, are deployed from Beale Air Force Base, Calif.
A pilot guides a U-2 Dragon Lady assigned to the 99th Expeditionary Reconnaissance Squadron of the 380th Air Expeditionary Wing to a parking spot on the airfield while being guided by a maintenance Airman from the 380th Expeditionary Aircraft Maintenance Squadron Dragon aircraft maintenance unit at a non-disclosed base in Southwest Asia. These U-2 Dragon Lady images were photographed by military veterans and service members. U.S. Air Force Staff Sgt. 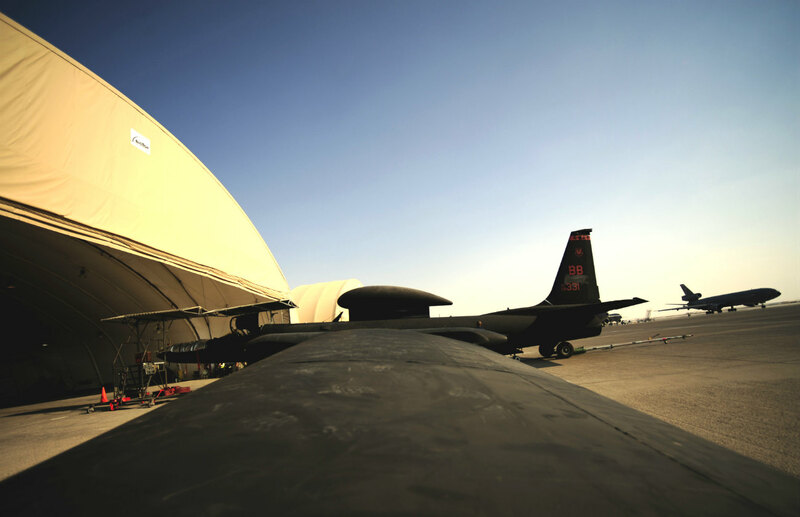 Joshua Montgomery, 380th Expeditionary Aircraft Maintenance Squadron, inspects the intake of a U-2 Dragon Lady from the 99th Expeditionary Reconnaissance Squadron at an undisclosed location in Southwest Asia, Nov. 23. 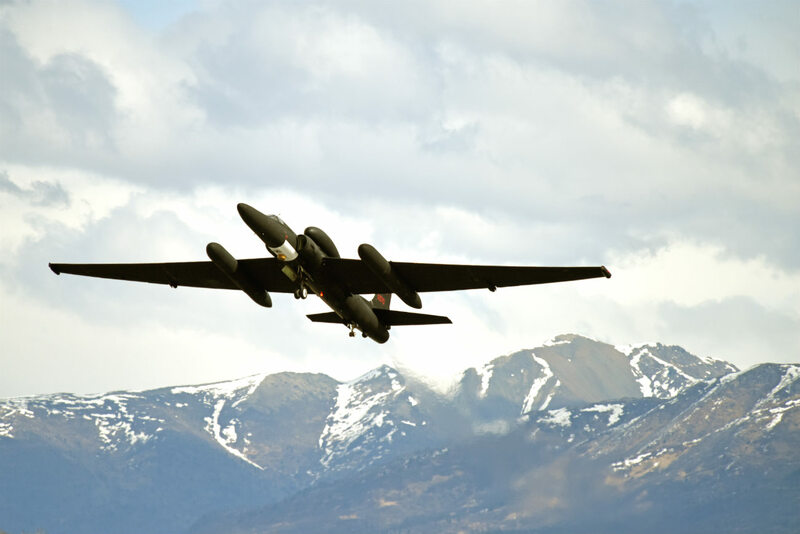 The U-2 is a high altitude reconnaissance aircraft that reaches altitudes above 70,000 feet. U.S. Air Force Staff Sgt. 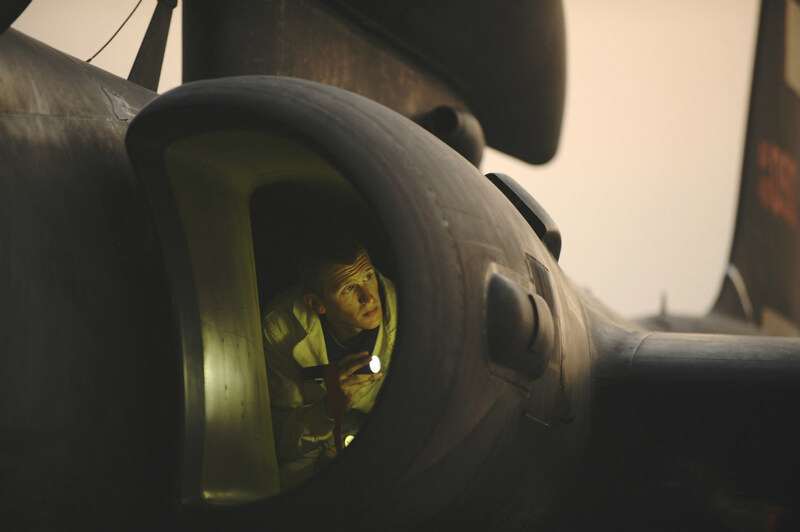 Joshua Montgomery, 380th Expeditionary Aircraft Maintenance Squadron, inspects the intake of a U-2 Dragon Lady from the 99th Expeditionary Reconnaissance Squadron at an undisclosed location in Southwest Asia. U.S. Air Force maintenance technicians, assigned to the 380th Expeditionary Aircraft Maintenance Squadron, work in and around the U-2 Dragon Lady aircraft on Nov. 23, 2010. The U-2 Dragon Lady aircraft is currently deployed to an undisclosed location in Southwest Asia. U.S. Air Force maintenance technicians, assigned to the 380th Expeditionary Aircraft Maintenance Squadron, work in and around the U-2 Dragon Lady aircraft. A pilot guides a U-2 Dragon Lady across the air field April 24, en route to a mission in support of operations in the U.S. Central Command area of responsibility from a non-disclosed base in Southwest Asia. The pilot and the U-2 are with the 99th Expeditionary Reconnaissance Squadron, a unit of the 380th Air Expeditionary Wing. Through the first three months of 2010, U-2's from the 99th ERS flew nearly 200 missions in support of intelligence, surveillance and reconnaissance requirements for deployed forces supporting operations Iraqi Freedom and Enduring Freedom and the Combined Joint Task Force-Horn of Africa. A pilot guides a U-2 Dragon Lady across the air field April 24, en route to a mission in support of operations in the U.S. Central Command area of responsibility from a non-disclosed base in Southwest Asia. A U-2 Dragon Lady from Beale Air Force Base, Calif., prepares to land at Joint Base Andrews, Md., Sept. 17, 2015. The aircraft was on display during an air show Sept. 19, 2015. This year marks the 60th anniversary of the U-2, one of the oldest operational aircraft in the Department of Defense. A U-2 Dragon Lady from Beale Air Force Base, Calif., prepares to land at Joint Base Andrews, Md. These U-2 Dragon Lady Images were photographed by military veterans and service members. A 380th Air Expeditionary Wing U-2 Dragon Lady launches from an undisclosed location in Southwest Asia. U-2 pilot Maj. Ryan enters into a cockpit before flying a sortie in support of Combined Joint Task Force-Operation Inherent Resolve at an undisclosed location in Southwest Asia, Feb. 2, 2017. 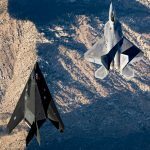 During the sortie, the aircraft completed 30,000 hours of flight. 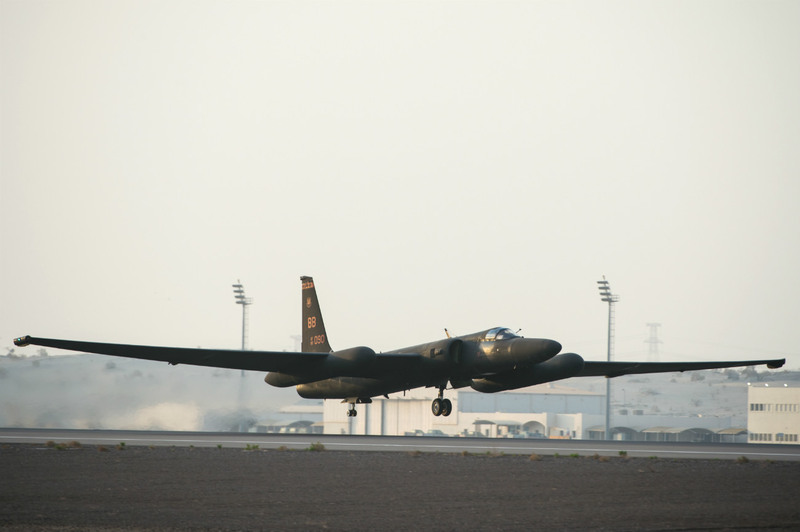 This marked the second U-2 in the USAF fleet to reach the milestone and the first overall while flying expeditionary missions under Air Force Central Command. U-2 pilot Maj. Ryan enters into a cockpit before flying a sortie in support of Combined Joint Task Force-Operation Inherent Resolve at an undisclosed location in Southwest Asia. 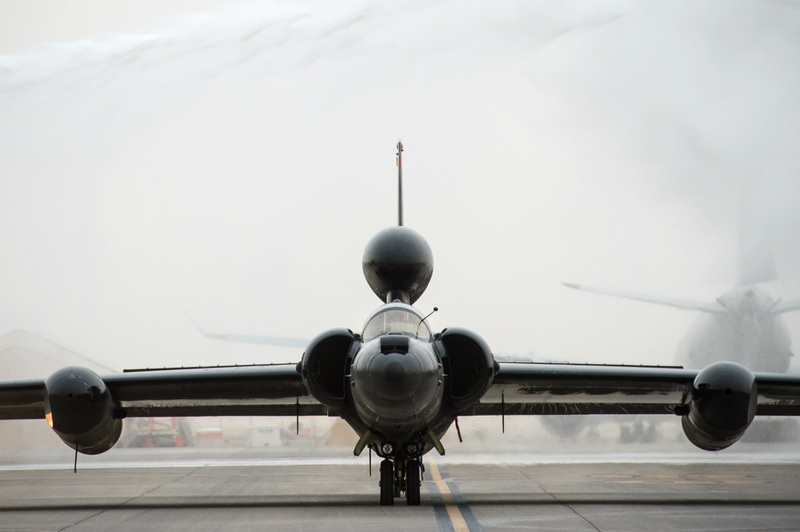 A U-2 Dragon Lady prepares to takeoff during exercise Northern Edge 17 at Joint Base Elmendorf-Richardson, Alaska, May 8, 2017. 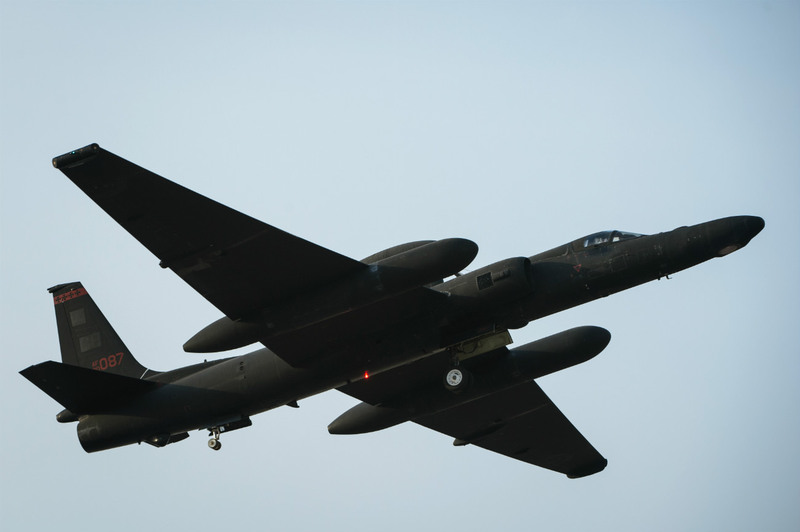 The U-2 participated for the first time in Northern Edge, which is a biennial joint training exercise involving approximately 6,000 personnel and 200 fixed-wing aircraft, and dates back to 1975. 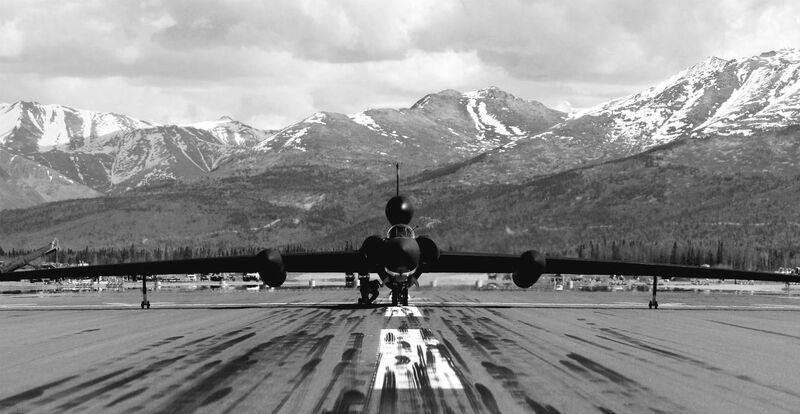 A U-2 Dragon Lady prepares to takeoff during exercise Northern Edge 17 at Joint Base Elmendorf-Richardson, Alaska. You might also like captivating images of the B-1B Lancer.